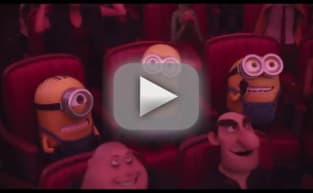 Minions Clip: The Minions Take Manhattan! The Minions are getting their own movie and the idea of it is utterly fantastic. As previewed in that Minions trailer, we meet the little yellow followers of all things evil from the early days of time. Yup, they worked with dinosaurs! Well, fast forward over the centuries as so many of their followings did not work out so well. They are searching the Earth for the next great villain and when they stumble into New York City in 1968, they find it in the form of Sandra Bullock’s Scarlet Overkill! Universal has released the first clip from Minions and it is an utter delight. It features three of our favorite Minions landing in Manhattan, and to paraphrase The Doors song heard in the clip, they are ready to Break on Through! Minions, which also stars Jon Hamm, arrives July 10, 2015 and will feature a soundtrack chock full of '60s classics. Check out where we last saw them and watch Despicable Me 2 online.